Medieval Monday with Nicole Locke & a Giveaway! It’s week nine for our Medieval Monday blog hop and today’s guest is author Nicole Locke. 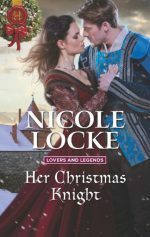 Nicole is sharing a snippet from her novel Her Christmas Knight so be sure to read on and leave her a comment to be in the running for our giveaway. Enjoy! The seal slipped in her suddenly damp hands. She knew that nose. She had broken that nose. Reluctantly, against her will, she raised her eyes to his again. He was still studying her. She felt permanently latched to him. She could not move even to let air into her lungs. Oh, she didn’t want to, but she knew those eyes. And they knew her. There was no confusion in their blue depths, there was only…waiting. But he couldn’t be the man she knew. She hadn’t heard from him or seen him for more than six years. She’d thought him dead. She wanted him dead. ‘Hugh?’ The name escaped before she knew she still had a voice, and the corner of his lips lifted. She knew that crooked smile. She knew that smile all too well. Next Monday, Nicole is at Elisabeth Hobbes’s blog here. You can also find my snippet on For All of Ever on Nicole’s blog here. This sounds really intriguing!! I would so love to read this! Wow, this book sounds good. I’m adding it to my to read list. Ooooh, I shall go and add this to my wishlist! This book sounds like a great read with Christmas approaching. Thanks for having me here today, Sherry! You’re very welcome. You and your characters are welcome any time! For some reason, I read “seal” and thought “fuzzy, grey, marine mammal” even though that makes no sense.